Badudu Stories is a collection of four short stories written from the perspective of young Aboriginal children learning English at the Mount Margaret Mission. Based on the author’s own experiences at the Mission as a child, the stories highlight just how isolating and confusing it can be to try to understand the many idioms of the English language. While Badudu Stories focuses on the experiences of Indigenous children, children from a variety of cultural backgrounds are sure to identify with the school students in the stories who struggle to translate phrases such as ‘too big for your boots’ and ‘smartie pants’ in a way that makes sense. The short story ‘What Do You Say?’ also highlights the confusion that can be caused by different cultural expectations of manners and social behaviour. These stories are simply written and are suitable for children aged 6 – 10. The inclusion of a variety of Wongi (Wongutha) language phrases makes this an ideal book to share with students discussing Indigenous Australian themes in the classroom. The book also includes a pronunciation guide/dictionary of Wongutha words used and there are teachers’ notes available from the Fremantle Press website. The book is also suitable for older students considering Indigenous issues including the Stolen Generations and assimilation practices, as the stories reflect the author’s own experiences learning English after arriving at the Mount Margaret Mission at the age of five. 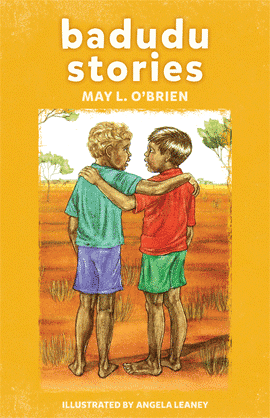 The experiences of the children in the stories and the brief explanation of the stories by May L O’Brien at the conclusion of the book offer students an excellent starting point for classroom discussions.